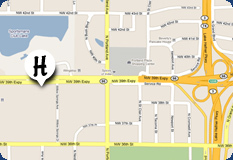 Conveniently located on NW 39th Expressway, Haley’s Carpet offers a large selection of beautiful, durable carpet, plus hardwood, tile, cushion-step vinyl and laminate flooring choices. Whether you’re thinking about a new floor, or remodeling the kitchen or bath—or even flooring an outdoor patio or boat—make sure Haley’s Carpet tops your list. Selection you’ll love, prices you can live with. Whether new construction, bathroom renovation, or it's simply time for something new, we'll come by your place and take your floor measurements. We can discuss the best options for your area, from tile to carpet and everything in-between. SmartStrand carpet from Mohawk is engineered for smarter stain resistance. The manufacturer is so confident your carpet will repel food, drink, mud and other carpet foe, there's a lifetime stain warranty on top of four other industry-leading 15-year warranties. We offer three types of underlayment padding: 3/8" 4 lb, 1/2" 6 lb and 1/2 8lb with odor wetness guard. Visit our showroom today to see all our flooring and underlayment options.